Want to gain a better understanding of the book of Mark? Tom Wright has completed a tremendous task: to provide comprehensive guides to all the books of the New Testament, and to furnish them with his own fresh translation of the entire text. Each short passage is followed by a highly readable commentary with helpful background information. The format makes it appropriate also for daily study. Tom Wright's eye-opening comments on the gospel and what it might mean for us are combined, passage by passage, with his own fresh and involving translation. Making use of his true scholar's understanding, yet writing in an approachable and anecdotal style, Wright captures the urgency and excitement of Mark's gospel in a way few writers have. 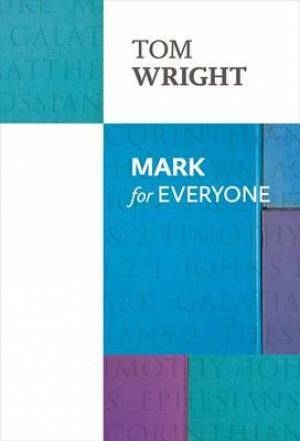 Mark for Everyone by Tom Wright was published by SPCK Publishing in March 2014 and is our 1239th best seller. The ISBN for Mark for Everyone is 9780281071913. What is unusual about this commentary? It is exciting. It may turn your life upside down. Walking with Jesus and looking through the eyes of those present we discover how shocking many of Jesus’ words appear as he displays in word and deed God’s love, power, and covenant faithfulness to a hopeless and helpless generation; how true repentance and faith turns our world upside down when we begin to share in the joys and travails of God’s new Kingdom. Challenging questions and comments encourage us to respond. Got a question? No problem! Just click here to ask us about Mark for Everyone.